Located on Galveston Bay, where a constant breeze and endless family entertainment abound; the new Holiday Inn Kemah is conveniently located within walking distance from the famous Kemah Boardwalk 25 miles from Downtown Houston and Galveston Island. Whether its water sports, dining, shopping, or just wanting somewhere to spend the day, the Holiday Inn Kemah is the place. Blast off at Space Center Houston, stroll through the Armand Bayou Nature Center, and relax on the water at Clear Lake. The Haak Vineyards and Galveston Beaches and the new La Porte Cruise Terminal are just a short drive away. Business travelers will appreciate that we keep you connected with our free wired and wireless high-speed Internet access, as well as copy and fax services in the 24-hour business center. Dupont, Exxon Mobile, Marathon Oil are just a few of the companies that call the Kemah area home. 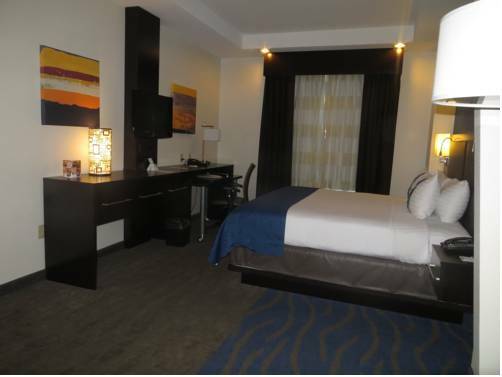 Relax in your own modern but comfortable room, including a microwave, refrigerator, executive desk and ergonomic chair, 32 flat panel TV, and the best nights sleep youve had in weeks. If youre hungry, come downstairs to our Sporting News Grill & Bar or order in room service. Whether planning a social occasion or corporate meeting, our 2278 sq ft of meeting space and catering services will make your next event a success. Come to Kemah, TX and stay with us! Sidelines Bar & Grill: Daily drink & food specials! The Lighthouse Ballroom: Whether it is your big day or an important speaker, The Holiday Inn Kemah Near Boardwalk offers a competitively priced event facility for your personal or corporate needs. Our ballroom can be transformed into a corporate day meeting to a grand gala. Kemah Boardwalk and Restaurant District35 acre area offering a variety of restaurants, especialty shops, antiques and seasonal shopping. Amusement rides and carnival games, day cruises, boating and fishing. Baybrook MallBaybrook Mall, is a shopping mall located 30 km southeast of downtown Houston at Interstate 45 South and Bay Area Blvd in Friendswood, Texas, United States. It has five major anchors and more than 170 stores and restaurants. Shop SeabrookMuch like our community, the retail experience of Seabrook is unique, eclectic and always friendly! Beacon Lakes Golf CourseBeacon Lakes Golf Club offers an 18 Hole LIGHTED Championship Facility Open to the Public. Night golf is fun. Our Par 72 course is best described as a fun, yet challenging layout and measures 6777 Yards. All levels of players love the course. Bay Forest Golf CourseWinding through a natural bayside setting of trees and bayou-fed waterways, it has earned the prestigious distinction of being one of the top 20 municipal golf courses in Texas. Forest offers amenities for both the casual and championship player. Kemah Boardwalk & Restaurant DistrictThe Kemah Boardwalk is open daily providing fun for everyone! Located just 0.10 miles from Holiday Inn Kemah, the Kemah Boardwalk is home to fabulous waterfront restaurants, amusements, charming retail stores, festivals and seaside shows every day. Space Center HoustonSpace Center Houston is the official visitor center of the Lyndon B. Johnson Space Center the National Aeronautics and Space Administration's center for human spaceflight activities located in Houston, Texas. Family fun, entertaining and educational. Galveston Pleasure PierFeaturing waterfront fun and entertainment like no other Gulf Coast destination, the Galveston Island Historic Pleasure Pier features family-oriented attractions including rides, midway games, a wide selection of food venues and retail shops. The Grand 1894 Opera HouseThe Grand 1894 Opera House in Galveston, Texas is a historic theater currently operated as a not-for-profit performing arts theater. The Romanesque Revival style Opera House is located at 2020 Post Office Street in Galveston's Strand District. The GalleriaThe Galleria, is an upscale mixed-use urban development centrally located in the Uptown District of Houston, Texas,The Galleria is Houston's most popular retail and tourist destination, meeting every style and taste. Buffalo Bayou ParkEnjoy hike and bike, disc course, dog park, an art park and many more activities. Seawolf ParkSeawolf Park is a memorial to USS Seawolf, a United States Navy Sargo-class submarine mistakenly sunk by U.S. Navy forces in 1944 during World War II. It is located on Pelican Island, just north of Galveston, Texas, in the United States. Toyota CenterToyota Center is an indoor arena located in downtown Houston, Texas. It is named after the Japanese automobile manufacturer Toyota. Home of The Houston Rockets!! !